Attention all local auto mechanic and body shops! Are you looking to hire young professionals that are certified in the automotive industry? Look no further as Solano Community College has opened up their brand new Auto Tech Center in Vallejo! We welcome reps from all local auto shops to attend our upcoming Joint Chamber Mixer on Thursday, June 19th to get connected with the educational foundation that is educating your future employees with the most up-to-date technology that all modern cars have to date. 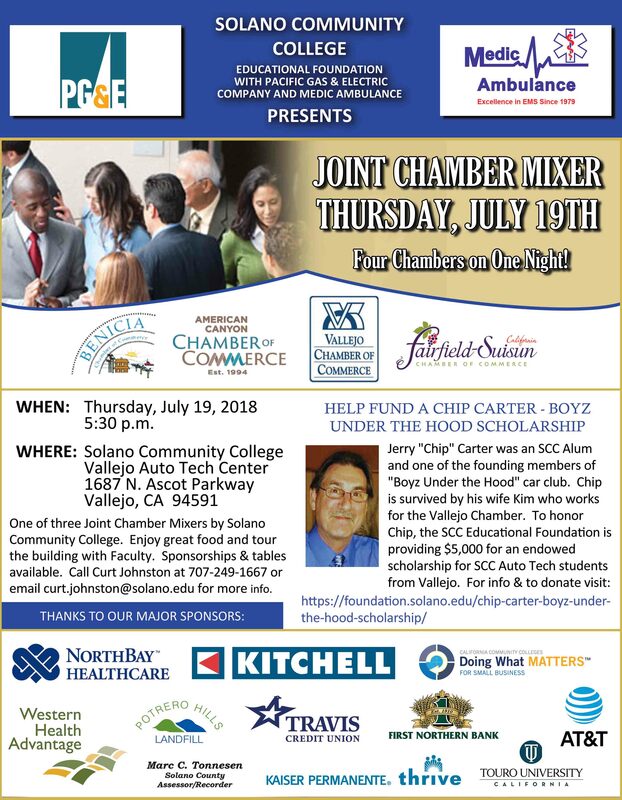 This is a FREE event to attend with food, drinks, raffles, and networking opportunities with the school and members from four local Chambers of Commerce. Bring a raffle prize to donate! Give us a call if you have any questions at (707) 644-5551 or email us at info@vallejochamber.com today! Network with members from four local Chamber of Commerce!